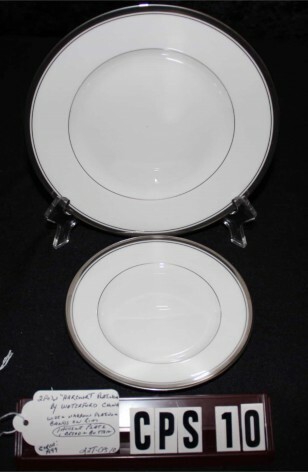 Waterford Fine Bone China (two Plates) in the "Harcourt" Pattern #WFCHAP, Circa 1999-2008. Available are two (2) Plates consisting of 1-Salad, Luncheon, or Accent Plate and 1-Bread & Butter, or Dessert Plate. Both are in the Platinum "Harcourt" Pattern #WFCHAP, by Waterford China. A Lovely White Background with both having a wide, and narrow stripe of Platinum the Rims edges. Very Distinguished Pattern, and yet quite usable for casual Dining. Great replacement pieces. Available are two (2) Plates consisting of 1-Salad, Luncheon, or Accent Plate and 1-Bread & Butter, or Dessert Plate. Both are in the Platinum "Harcourt" Pattern #WFCHAP, by Waterford China. A Lovely White Background with both having a wide, and narrow stripe of Platinum the Rims edges. Very Distinguished Pattern, and yet quite usable for casual Dining. Great replacement pieces.. Very Good Resale Condition unless noted below or in pictures.